Big Sky Bound | Observe as a New England Yankee attempts to transform into a Wild West Cowgirl. Who is this Yankee chick? Halloween used to be about me. 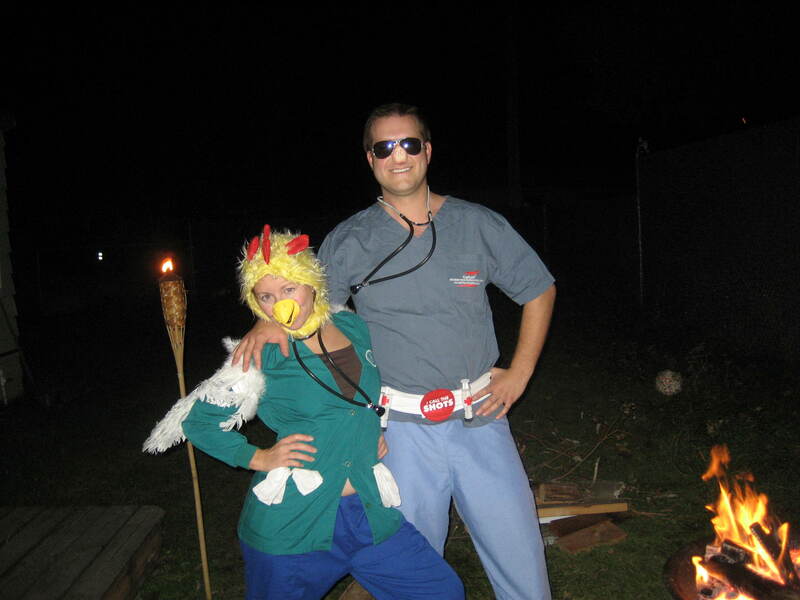 It used to be weeks of preparing my costume and then going out on the town to party until the wee hours of the morning. It was always about being goofy, dancing, drinking, eating late-night pizza and then sleeping in the next day….boy, times have changed. I am the daughter of a 4th grade teacher so crafty is in my genes. I like to make themed Halloween food, carve insane pumpkins, decorate the house with spider webs, paint faces, make costumes, etc. 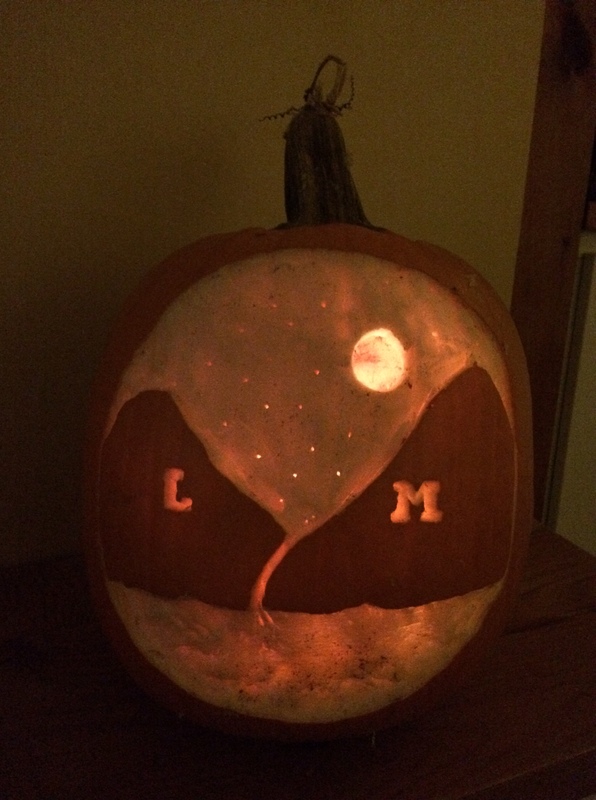 Simply put, I love Halloween. 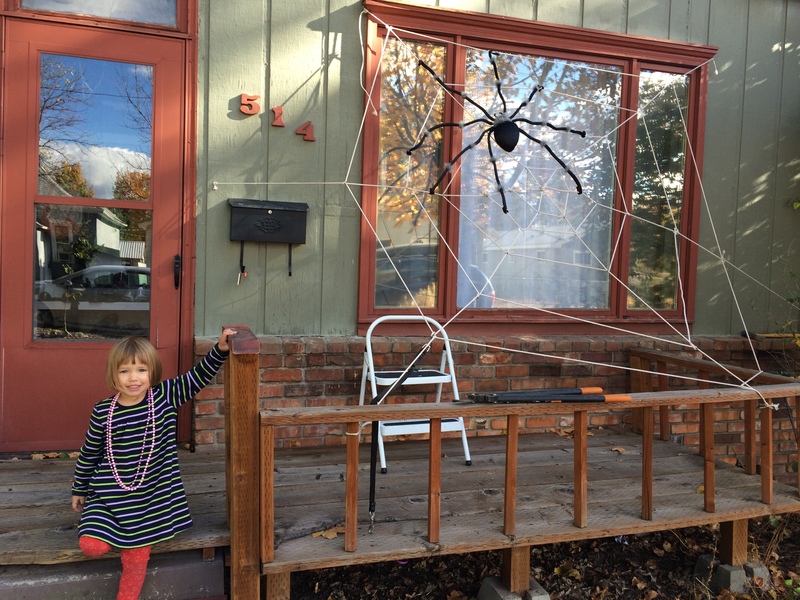 This year I got so excited about Halloween I made an inexcusable parental mistake – I asked Josie what she wanted to be for Halloween 4 weeks before the big day. She wanted to be the Hulk, so I ran out to Goodwill and grabbed a used one. While we were there, she saw a Cookie Monster costume that she had to have, and we made both purchases for $10. 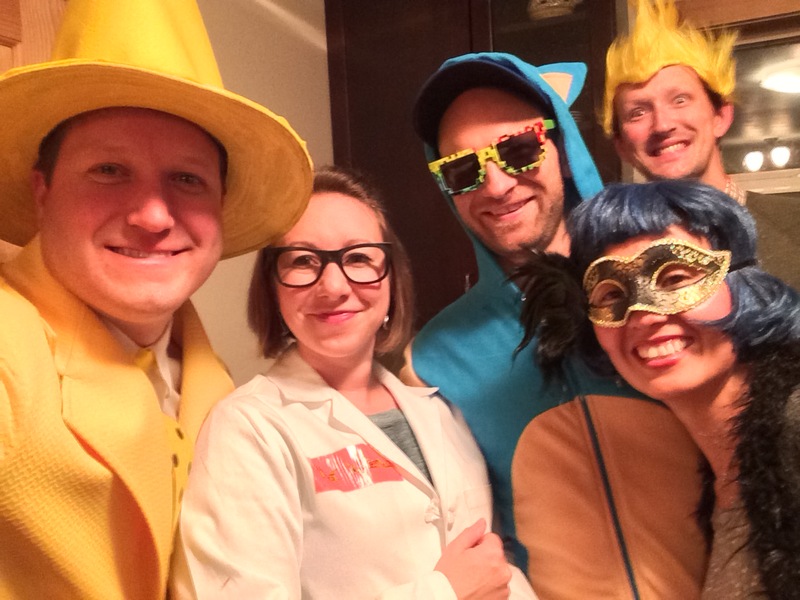 At that moment I felt like I had won Halloween. 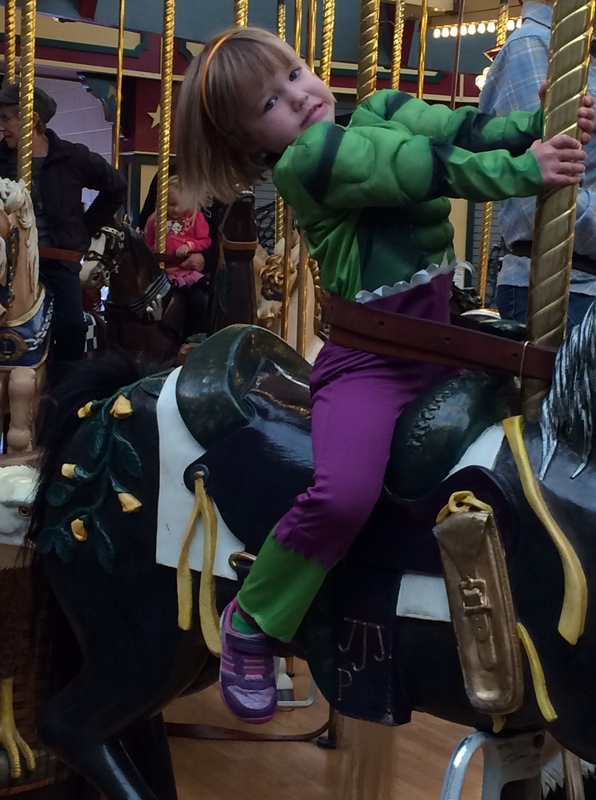 After a couple days wearing the Hulk costume everywhere it lost its shine and she was moving on. She PROMISED she wanted to be a Ninja Turtle, specifically Michelangelo, the orange guy. I had been fooled twice, so I toughed it our for 2 weeks of begging and finally caved and bought her a full priced turtle. 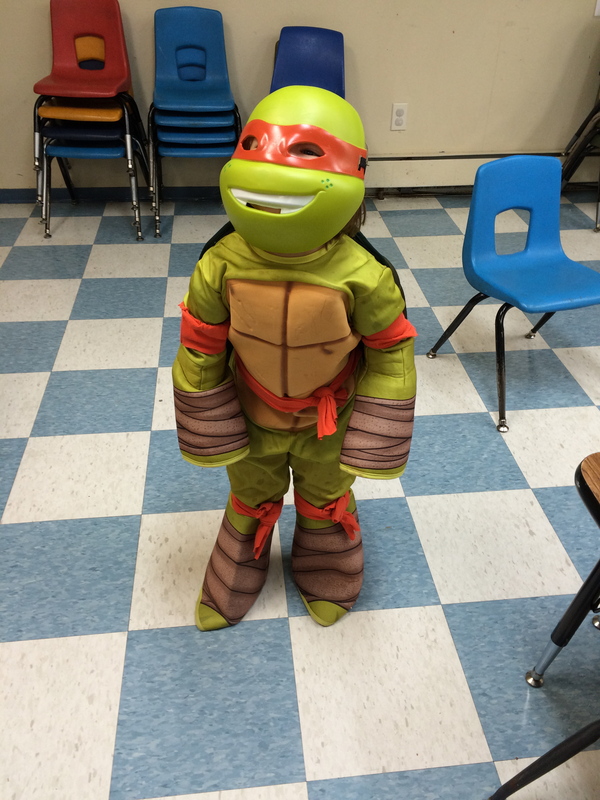 Josie wore the Ninja Turtle to school and was one of several turtles – but the only girl Michelangelo. 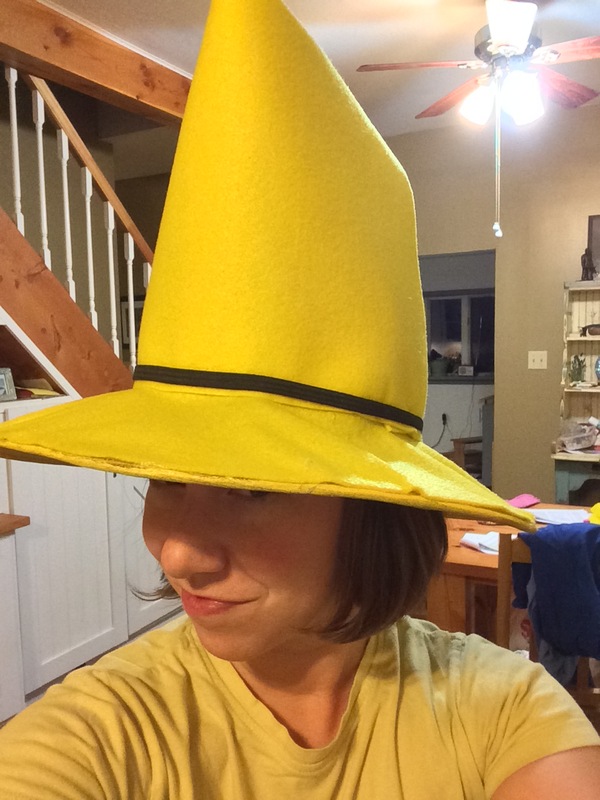 Meanwhile back at home, Josie unearthed last year’s Curious George costume that Grandma Nancy made. 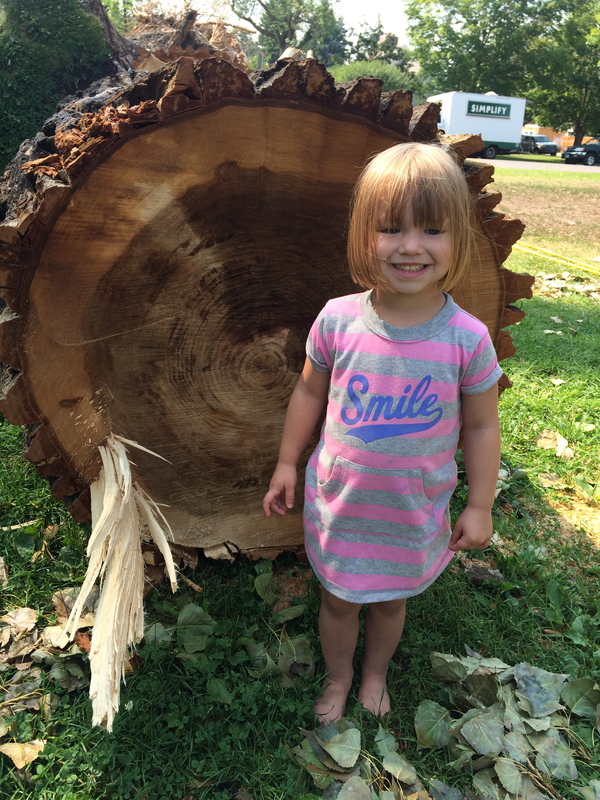 Last year, Josie declared she would not touch it because the fur felt yucky….two-year-olds can be total jerks. Three-year-olds, on the other hand, are cunning opportunists. Two days before Halloween Josie decided that she would actually like to be Curious George so she could crawl everywhere, jump off things, and be naughty but never get in trouble like George. We all got on board and the Ninja Turtle was out the window. 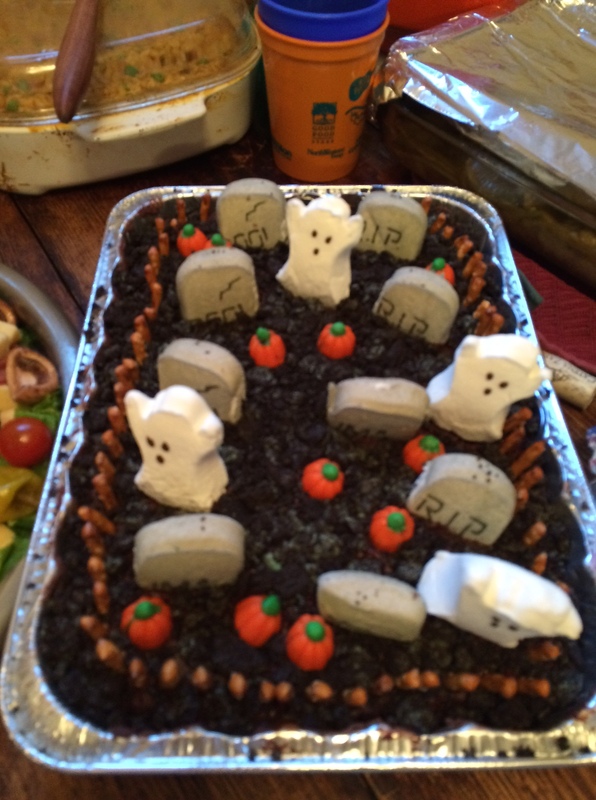 The moral of this story is DO NOT MENTION HALLOWEEN 4 WEEKS EARLY TO A KID. We could have saved $50 and 4 weeks of intense negotiation if I had only known that. On the flip side, watching Josie talk like Cookie Monster, Hulk smash, sing the Ninja Turtles theme song, and monkey around in her costume was pretty cute. 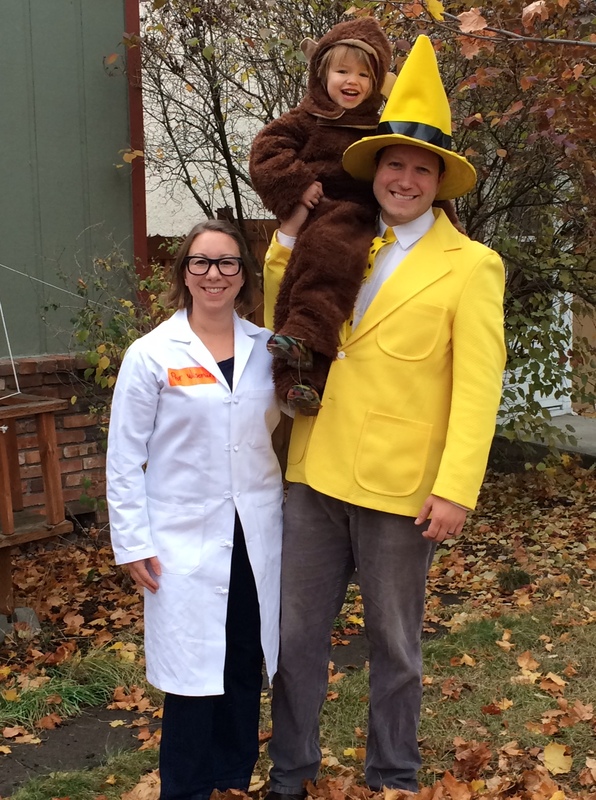 Being a parent on Halloween is fun, just a different kind of fun. We have been busy. So busy that I have neglected to blog in a VERY long time. Maybe this is a blog comeback, or maybe it’s an anomaly and will not happen again for another 3 months…time will tell. 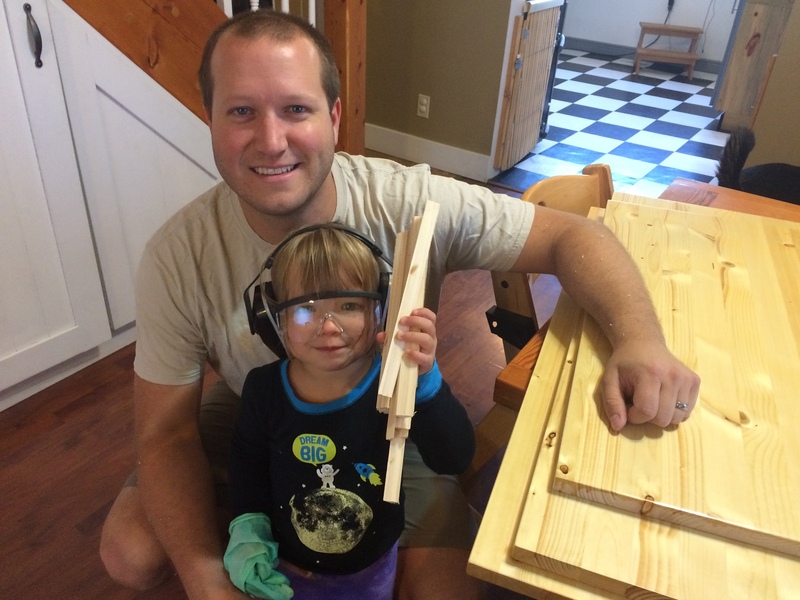 In between work and handling our sometimes sweet, sometime heinous threenager, Matt has been getting back into home improvement projects. We have been working on our kitchen for…uuuh…uumm…years. You ask, why has it taken you years when some people can do it in weeks? Josie is why. For example, as I was trying to hide for 15 minutes to write this blog post Josie ran over to let me know that she had stuck a bead up her nose – a big one – way up there – so far I could not see it. I spent the last 15 minutes helping her blow it out and digging with tweezers to grab the damn thing. ER visit averted for now. 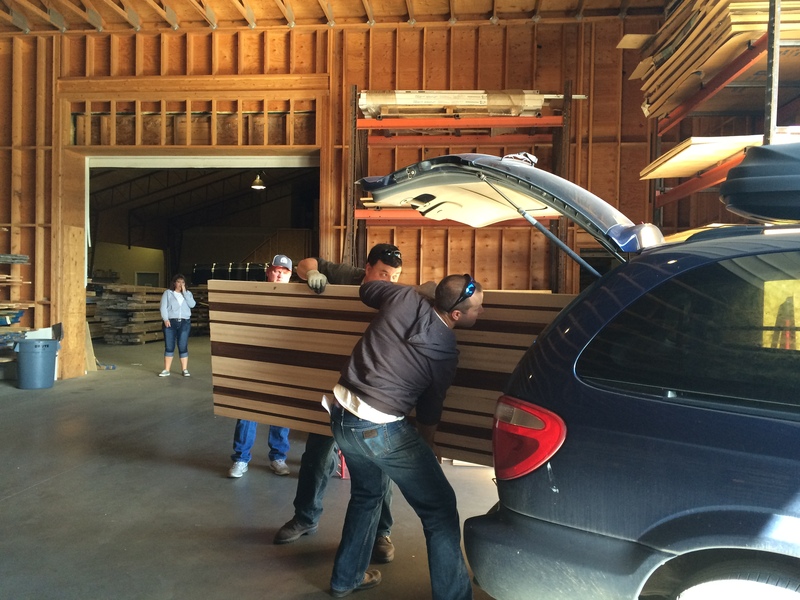 Today we took a family trip up to Arlee for the annual sale at Buckeye Hardwood & Lumber Company. Matt was giddy but promised he would not spend over $100 on odds and ends for his future turning projects (bowls, plates, tops, etc.). He also reminded me that I bought new shoes last night, which is a fair point. 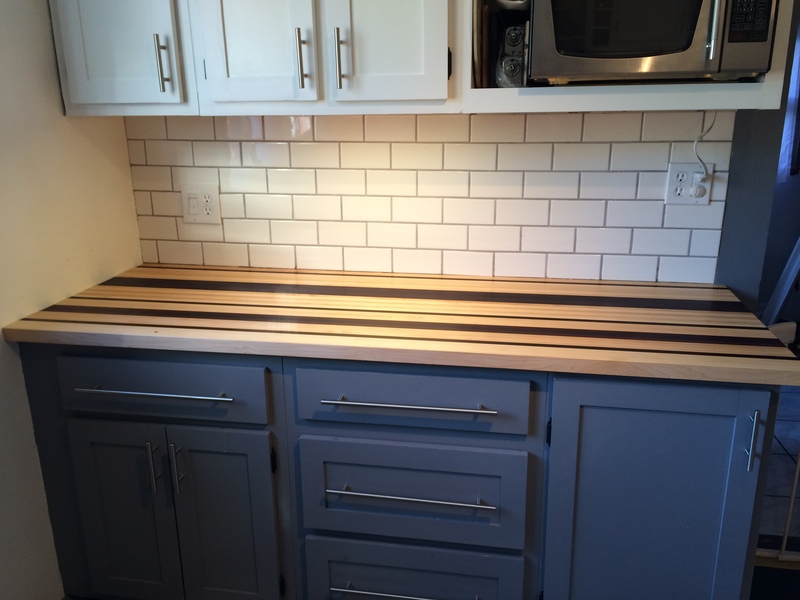 While browsing, we found a finishing touch for the kitchen that we did not even know we were looking for – a new counter top that they had been trying to sell for years. Matt practically had a woodgasam looking at the Maple slab, priced to move, and I knew we were not walking out of there without it. I endorsed the purchase because of the screaming deal, but mostly because Maple is the official tree of Vermont. Can I have my candy bribe for being good? 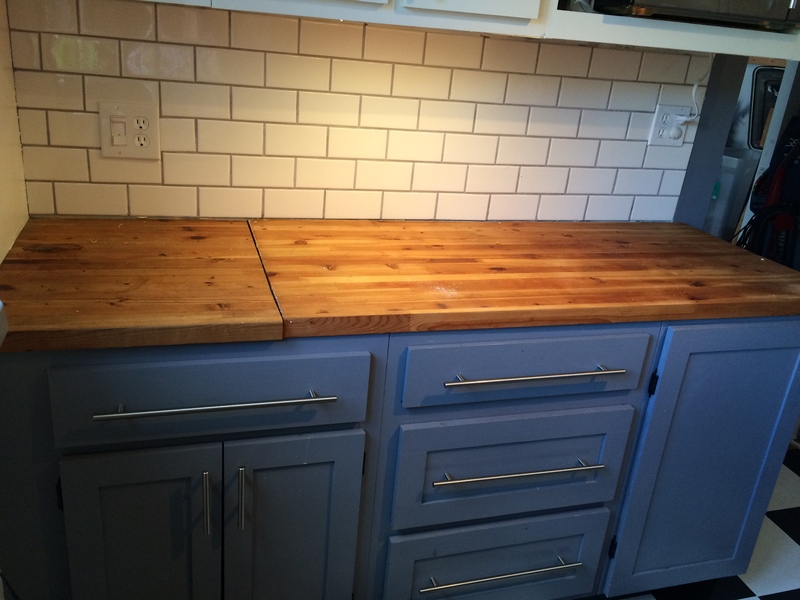 When we bought our house we had no idea that there were wood counters in the kitchen because they were black with years of dirt and grime – nasty! With a heavy sanding job we (Matt) brought them back to their former glory and we have loved them for 6 years. When we started remodeling the kitchen last year we added an extra cabinet which resulted in the wood top not fitting the bottom. Matt has left 2 pieces of wood counter hanging out unattached for the last year with the promise of someday connecting them. I thought he was being lazy, but it turns out he thought it was going to look like crap to have a big seam down the middle of our counter – good point, it does. 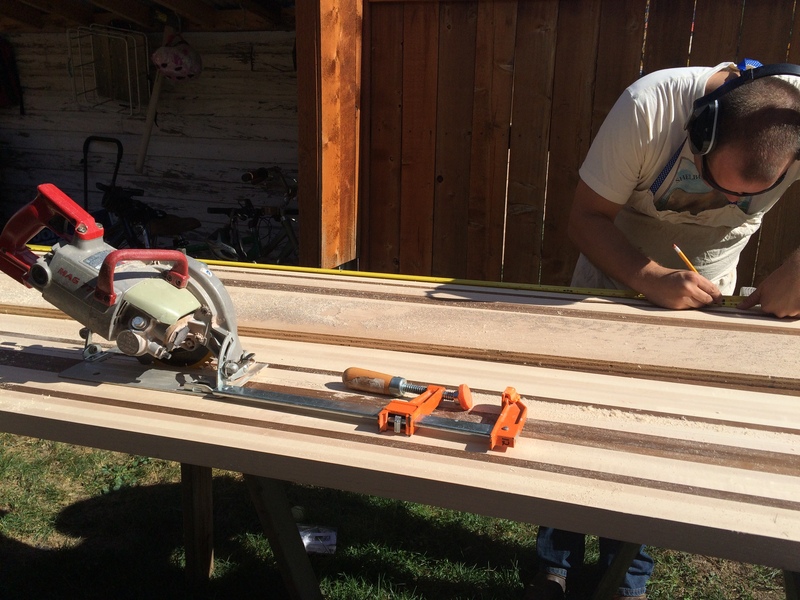 Matt had to cut the new counter way down for installation – I could barely watch. Without sounding too naggy or disrespectful I made sure to tell Matt not to screw it up. After many annoyed eye rolls in my direction, he made perfect cuts. Mineral oil applied and BAM, project complete! 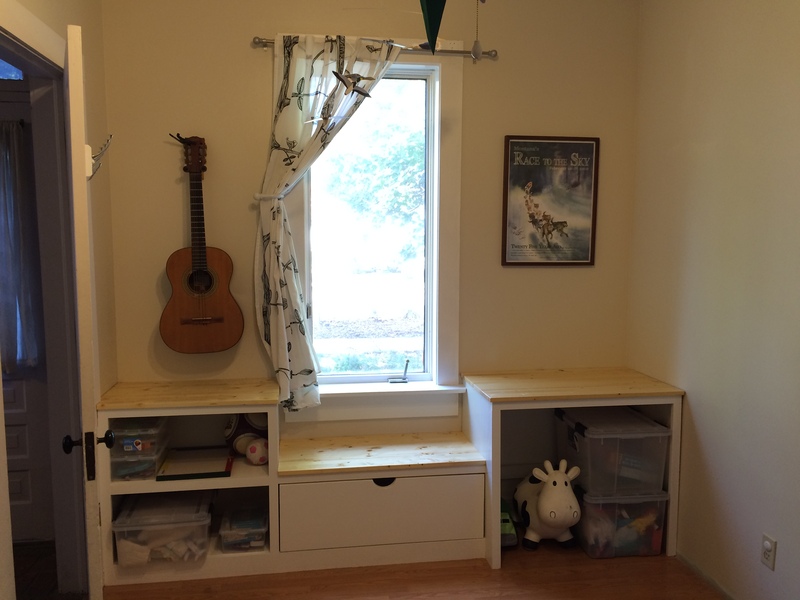 In other wood related news, A few weekends ago Matt decided to build Josie a desk, bookshelf and window seat. He also was planning to build shelves to the ceiling and I pumped the breaks. 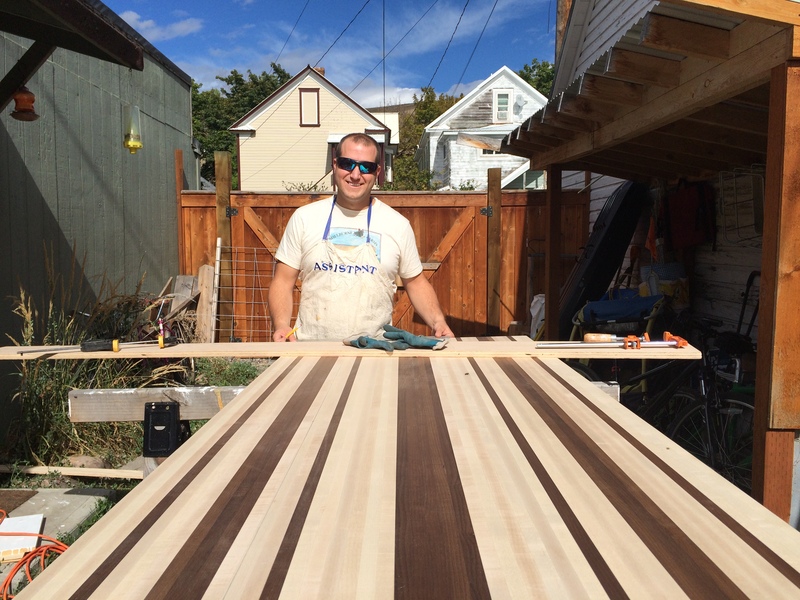 Matt is a wood project dreamer who sometimes needs to be brought back to reality. It took much more time that he thought, (see paragraph two for reason) but it looks great. 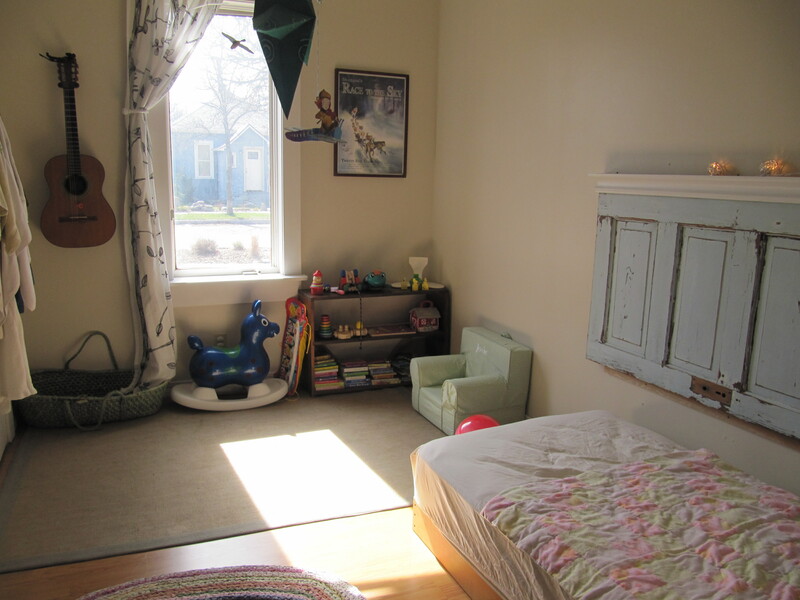 Our next wood dream sequence is to get new siding, a new front porch, new wood floors and a new laundry room. I better head to the gas station for a lottery ticket. Well, hello again, it’s been a long time. 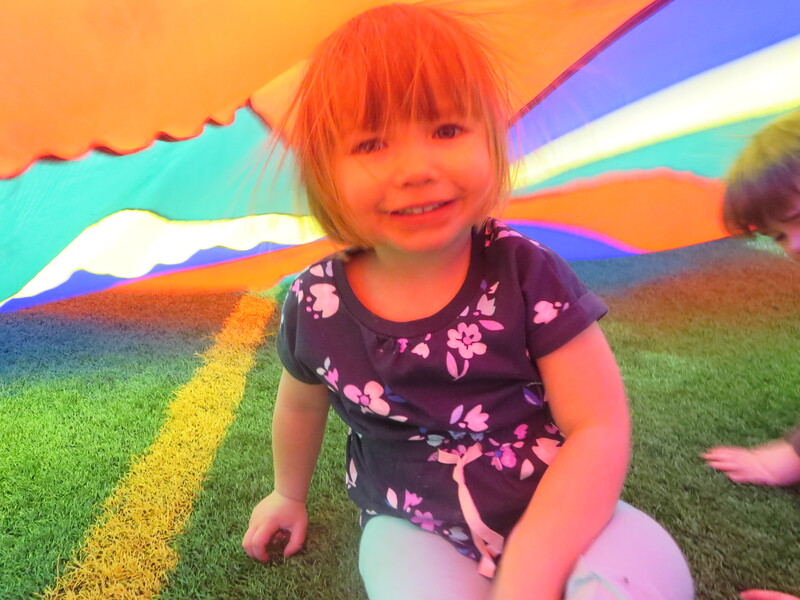 I hope you didn’t think that I fell off the face of the earth….I just happen to have a wild three-year-old who consumes my time and creativity. Most days, basic survival is prioritized over blogging. 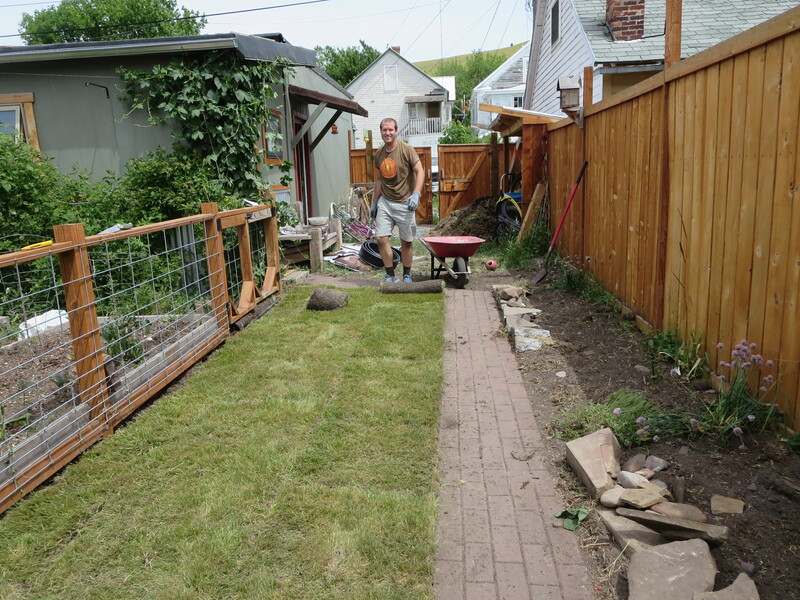 Pretty much nothing has changed since I posted 9 months ago – I am still running slowly and we are, again, attempting to improve our postage stamp backyard. 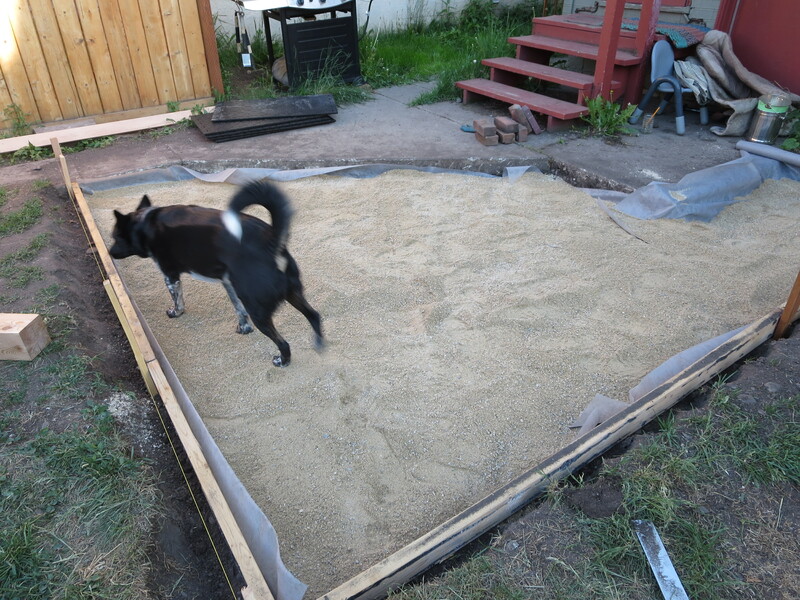 The hell patio/sod project from last year (queue PTSD!) 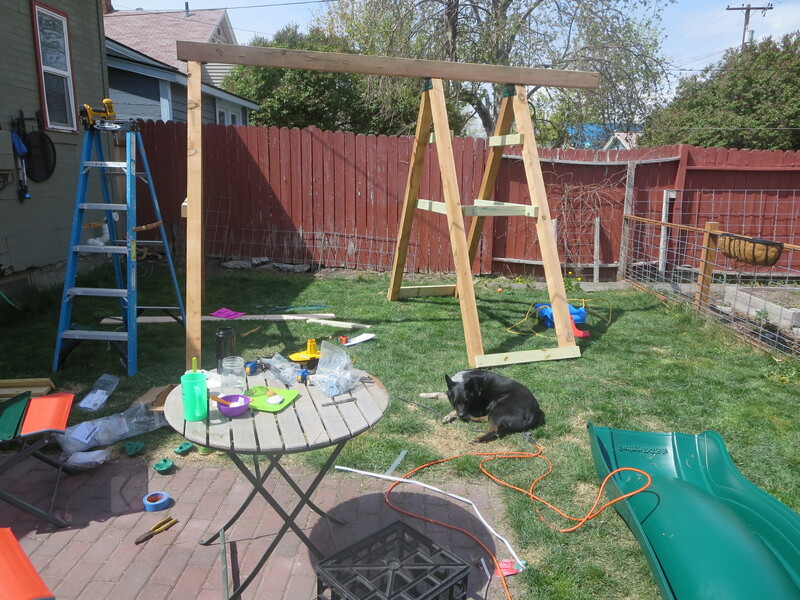 was long forgotten when we hatched this new spring idea to contain Josie and keep her from going to the park every day – a backyard swing set. I looked on Amazon and found rickety, cheap metal sets, and thought “BINGO!” lets just order one of these. Wood-man builder Matt had other plans. I knew we were in trouble when he started googling “do-it-yourself-play-set-castle-and-zip-line” and “DIY-wooden-fortress-swing-and-slide-jungle-gyms.” Oh crap, here we go again. Then he started drawing. 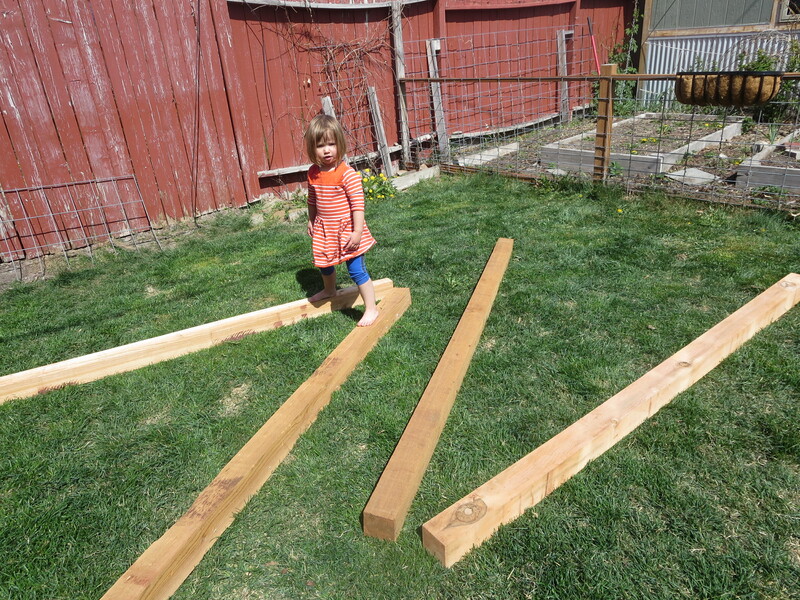 By the end of the drawing session we had a multi-swing, monster slide and climbing wall project all sketched out. Josie was even doing her homework to decide what she wanted. 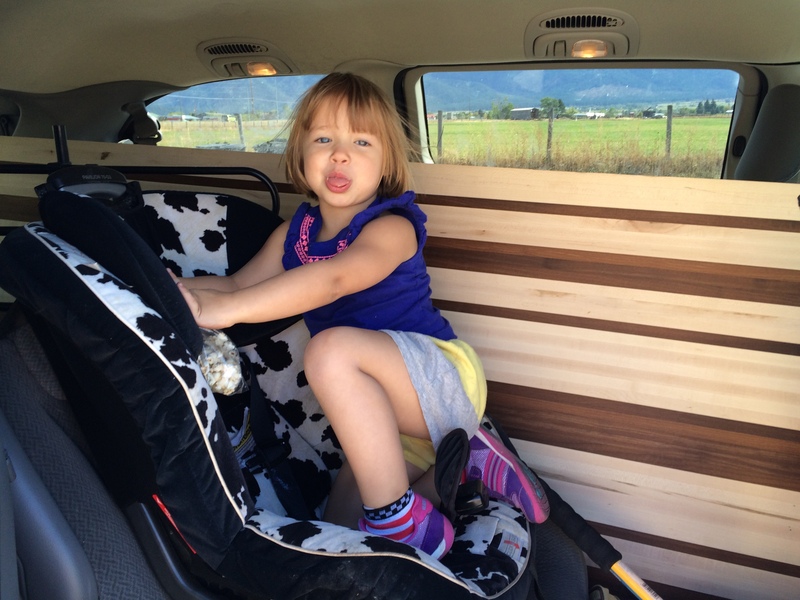 Last weekend, we packed up the whole fam and headed out for a day of swing set searching. 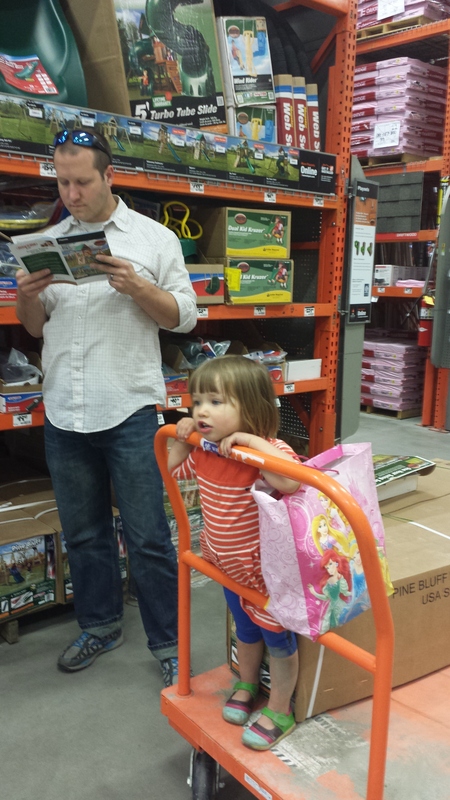 On the 3rd hour, 2nd snack break, and 5th store we found the DIY swing-set Mecca, Home Depot. Matt decided that the wood called for in the kit needed to be doubled in strength and size. 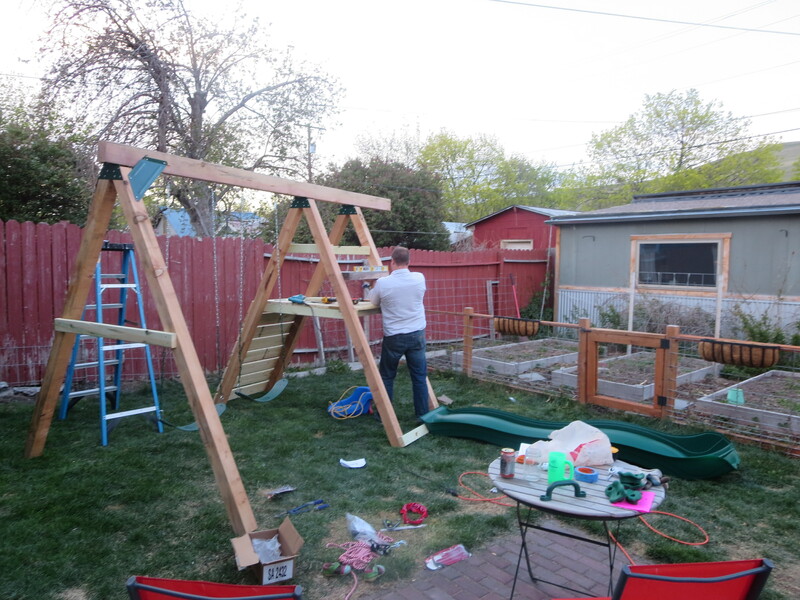 I think that this swing set will be the only structure standing after the rapture. 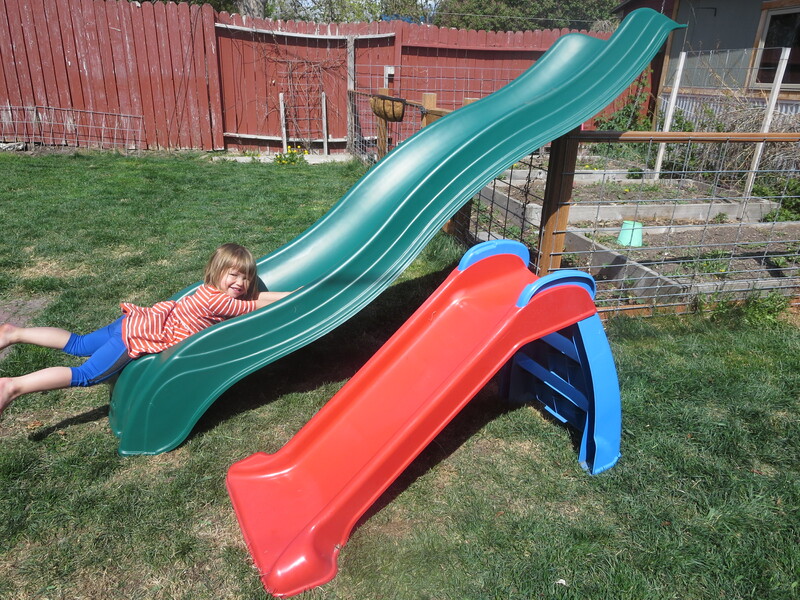 He also decided that the slide called for was too short and lame and he should supersize it for a more wild ride. Friends with kids, do not fear, we are planning to increase our home owners insurance policy. 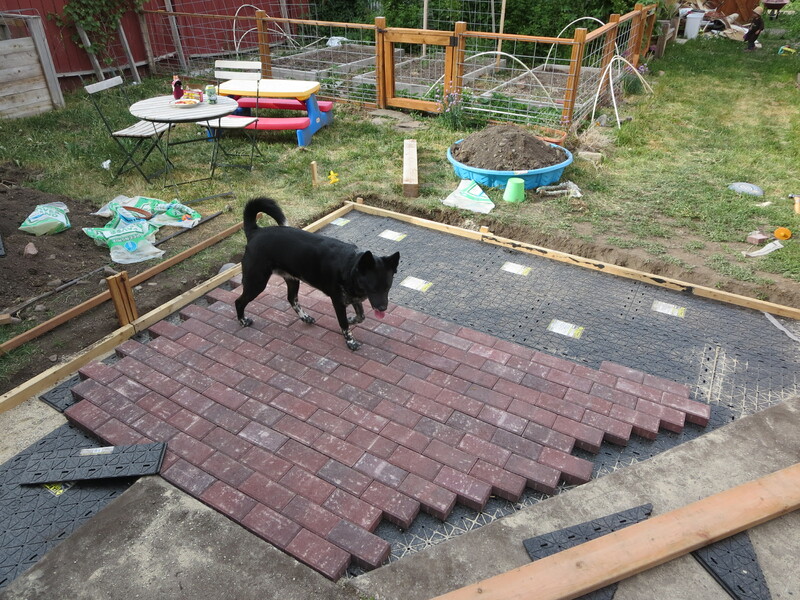 Josie was such a huge help that we (Matt) did not finish in one day. I was also a huge help and used my many skills to sand one post, screw in 10 boards, take pictures and drink beer. In a shocking turn of events, Matt actually followed the directions! 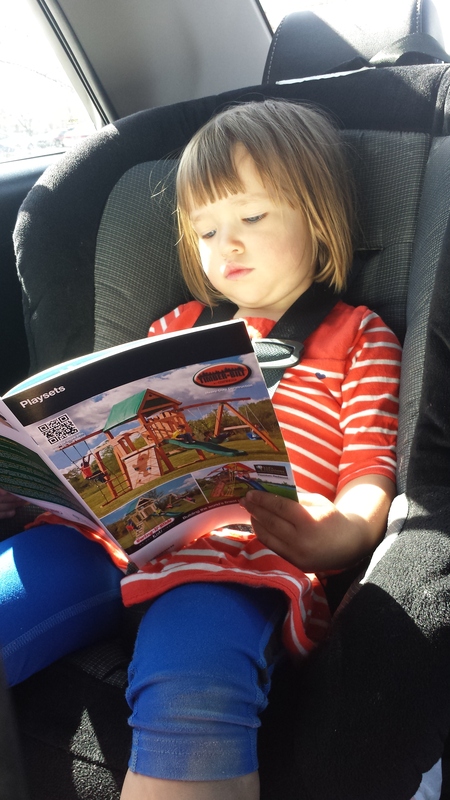 Josie woke up Sunday morning to a new swing set and pouring rain. A little rain did not stop her from getting out there and testing the goods – she is a hearty Montana girl! The postage stamp is officially full. 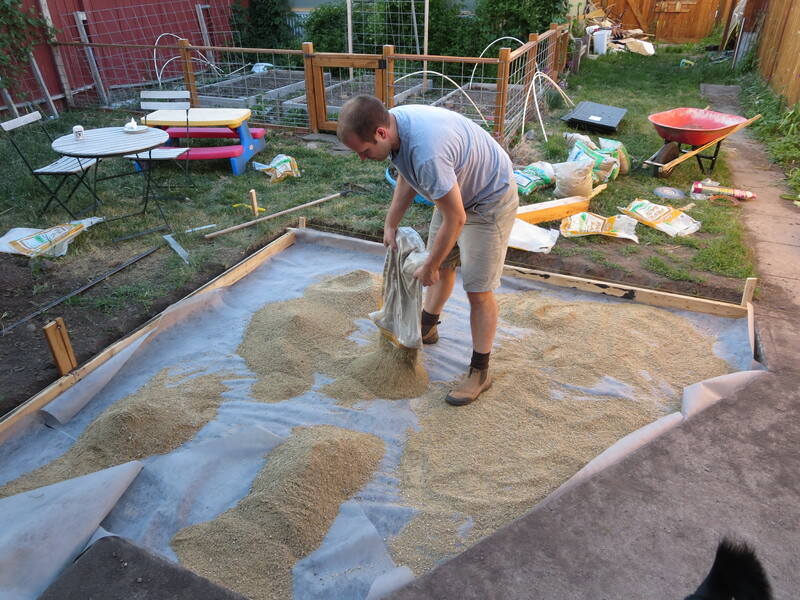 On to the next project…. 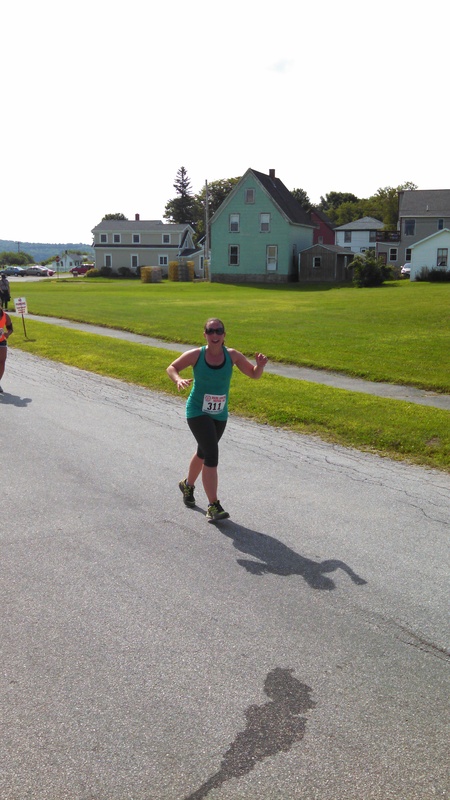 While I was on vacation in Maine earlier this month I decided to become a runner. This is a big deal for me because I have HATED running my whole life (are there emoticons or punctuation I can add to make HATE stronger?). I could chase a soccer ball for 90 minutes and love every minute of it, but if you asked me to run a mile I would undoubtedly throw a fit and give up. I have never run over 3 miles in my life due to boredom, mental weakness, physical weakness, distraction, procrastination, and a general lack of motivation. 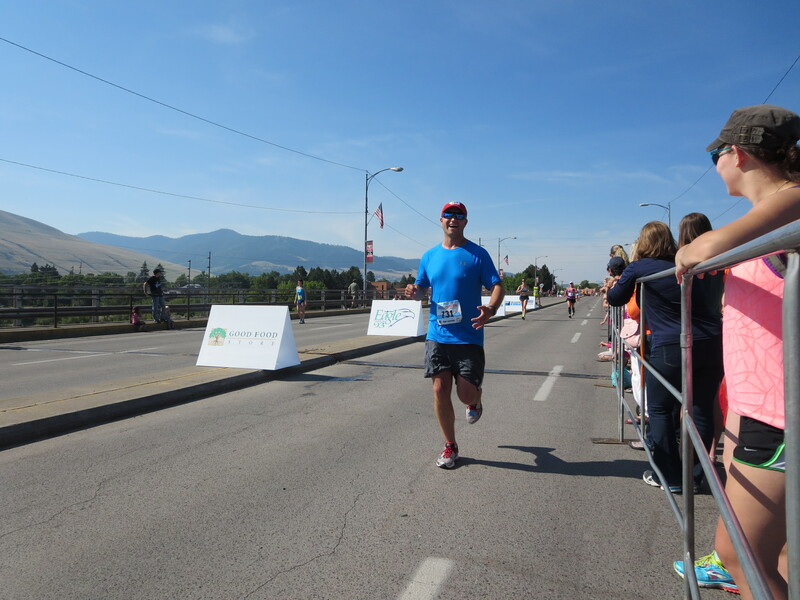 Matt on the other hand just ran his first race, the Missoula Marathon in 4 hours. Am I inspired or jealous? So why did I decide to jump on the insane bandwagon of running? Stupidity and peer pressure. 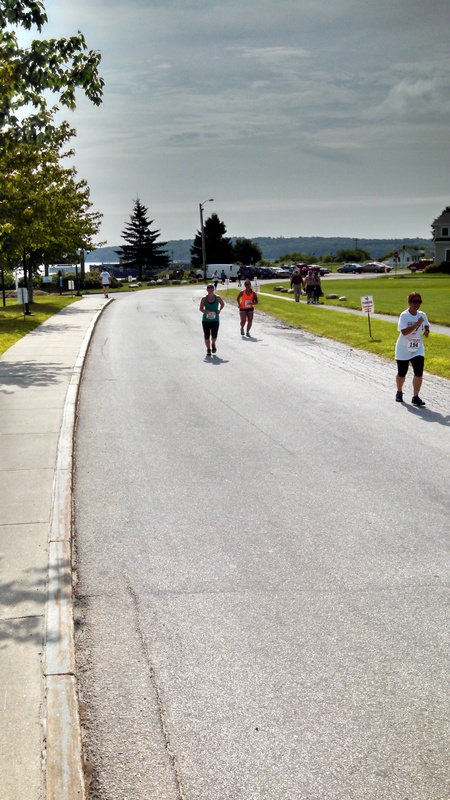 Matt decided to run the Lobster Fest 10K in Rockland, Maine as his second race so I signed him up for it before we even left Montana. 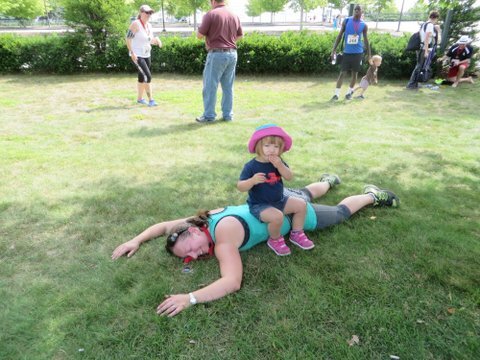 I opted to do the 5K fun-walk because I am a loser and knew I would die running however many miles 10K is. We arrived at the registration table at the race and I started looking around at my 5K cohort – they included baby strollers galore, old people and people in their PJ’s. I made a game day decision to run the 10K, ignoring factors like never having run a race before, a dead iPod, no training, and painful tonsillitis. All I could think was that if these people can run a 10K, I could run that far too! Wait, how far is 10K? Matt was surprised at this turn of events. 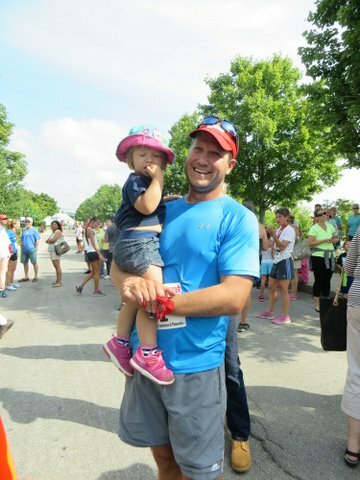 His nervous advice, after giving up on trying to talk me out of the race, was to try to have fun, talk to other runners, and go slowly. I was only worried about getting enough water, pooping my pants or dying in a ditch by the side of the road. When the race started Matt took off and I planted myself firmly at the back of the pack and tried to identify other novice runners to talk to. To my disappointment and annoyance, most runners were plugged into their iPod’s. I ignored that and ran up to people and yelled, “where are you from? !” Most ignored me, but I did meet a couple nice people. Look out lady, I’m going to talk to you! I let an old lady pass me who had a shirt on that read “if you can read this you are behind me and did not train either.” While it was true, I could not let my pride be bruised by letting her be in front of me, so I picked it up a smidge and passed her back. 5. OMG it’s so damn hot, there is no shade, I am frying, why didn’t I put on sunscreen? It looks like I’m walking, but I swear I’m running..
11. I wonder how I look? 12. I wonder if I will be able to walk tomorrow? 13. I wondering if you can feel armpit chaffing when it is happening? 14. Is the air thicker in Maine? And on and on and on it went……….. In the end Matt did not have to retrieve my body from the ditch so that was a win for both of us. I finished in a pathetic/proud 74 minutes. 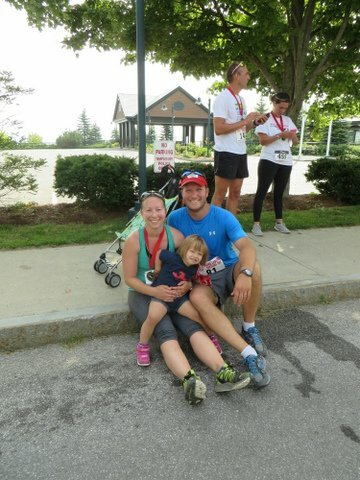 I looked like I peed my pants at the finish line from sweat, so I will be retiring those spandex! 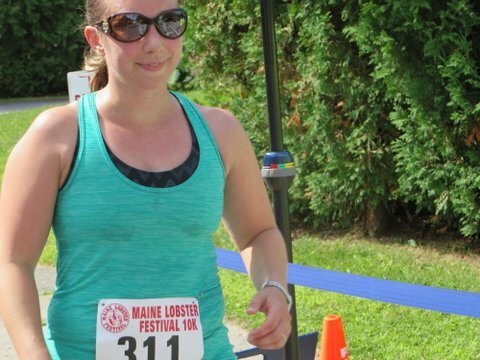 In all seriousness, by the end of the race all I could think about was that two years ago I could not even walk because of a debilitating back injury. I guess I have come pretty far. Over the next few days I decided to keep up the trend and ran almost every day. I have a completely black toenail to show for it, but Matt says it is a rite of passage into the running world. I even cautiously went to the running store this weekend and bought a running hat and some running socks. Oh my gosh, am I a runner? 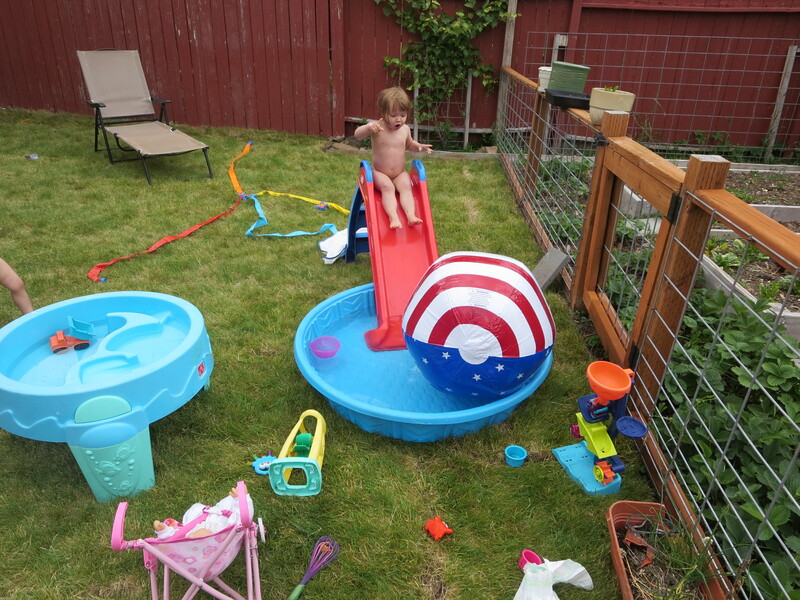 As the snow melted this spring, it came to our attention that our backyard was beyond all hope. 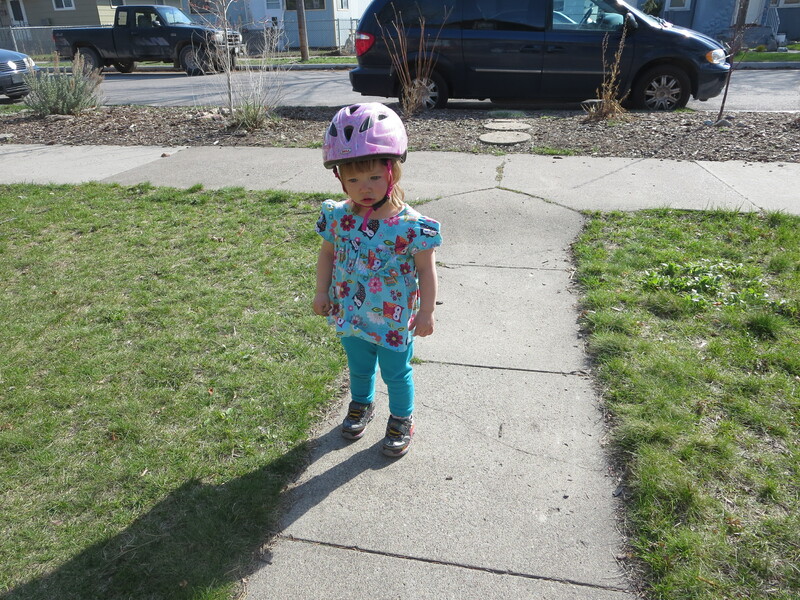 We decided that the best way to deal with this realization was to abandon the space and move to the front yard for Josie to play. When Josie started letting herself out the front door and walking to the park by MYSELF (as she would say), we decided we needed to take action. I wants to go to da park! While our yard is the size of a postage stamp – it’s OUR postage stamp and it was time to re-claim the space! 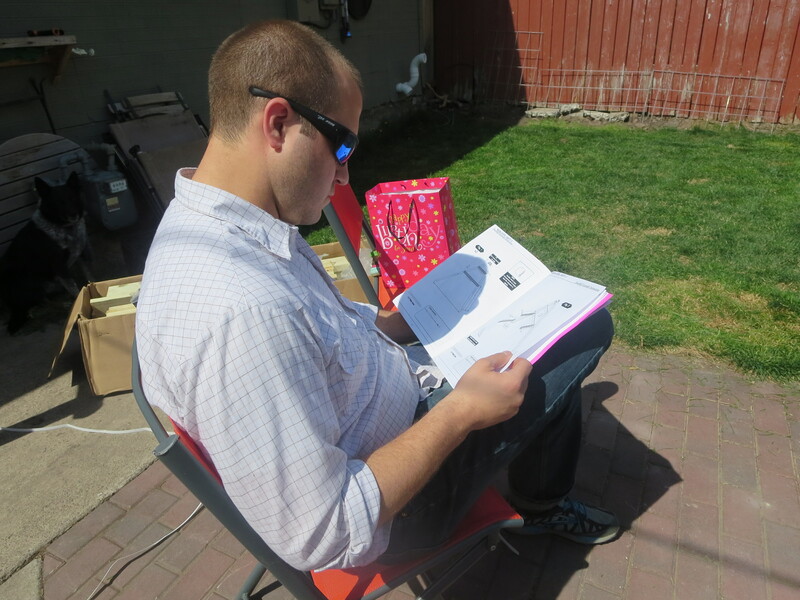 I sat out back and drew my plans for our future utopia, which included new French doors coming out of the back of our house, a multi-level deck, flag-stone patio, hot tub and fire-pit. Matt humored my plans for about 8 seconds then brought me down to earth with what the budget and timeline might look like. 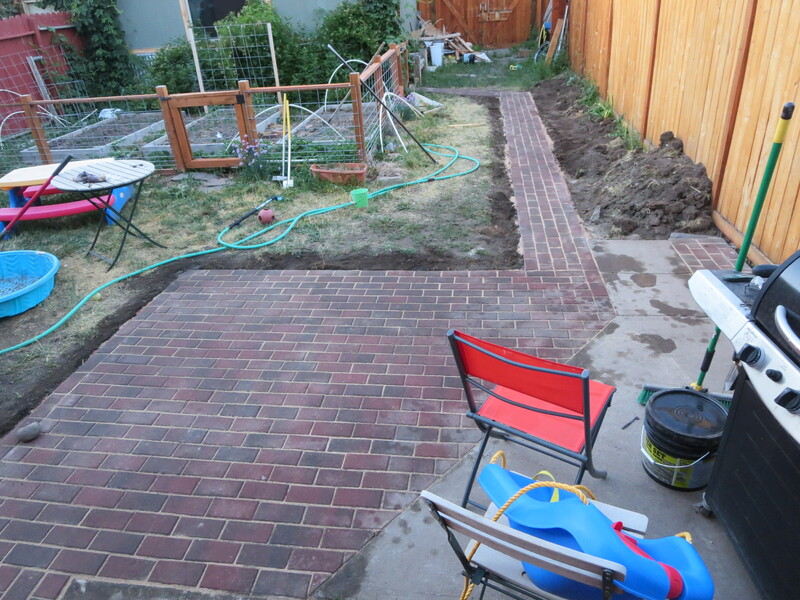 We settled on a plan for a new brick patio and grass – easy peasy right? That pretty much sums up our lives from 7-10pm 7 nights in a row. To all those professional stone masons out there – how the hell do you do that every day!? Props. 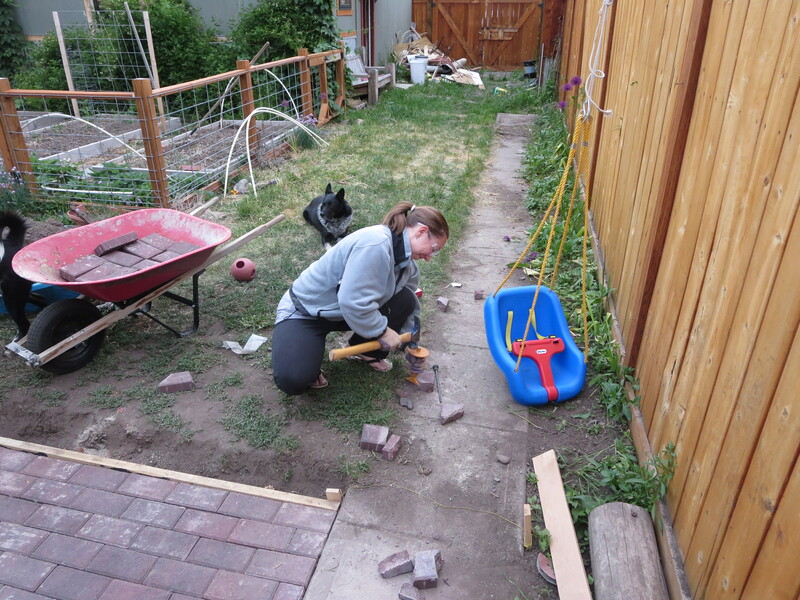 Once the patio hell was almost behind us, we decided to jump right into a whole new challenge – sod. 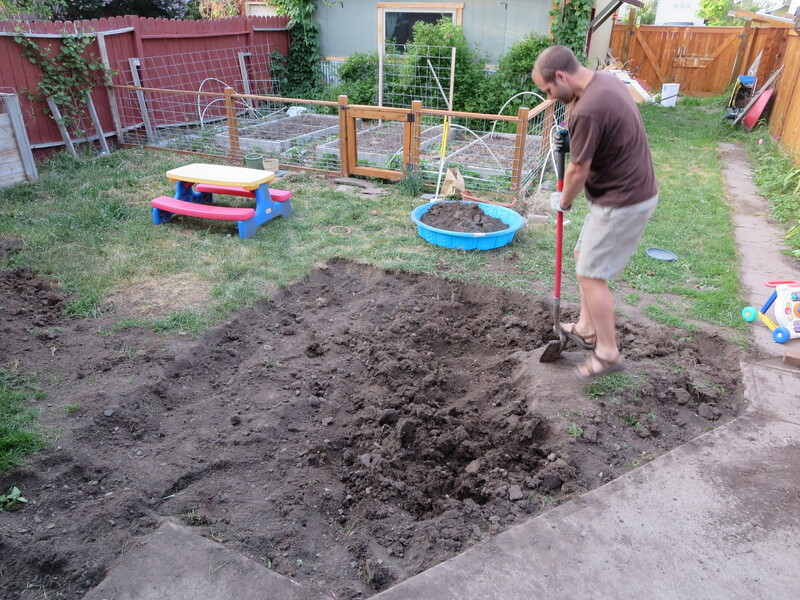 6. return broken sod cutter and get a complete refund – score! 14. abandon project and make your spouse finish it…. I am not proud that I abandoned Matt to get the project done alone, but it was probably for the best. The truth is, if I had continued to help we may have killed each other. 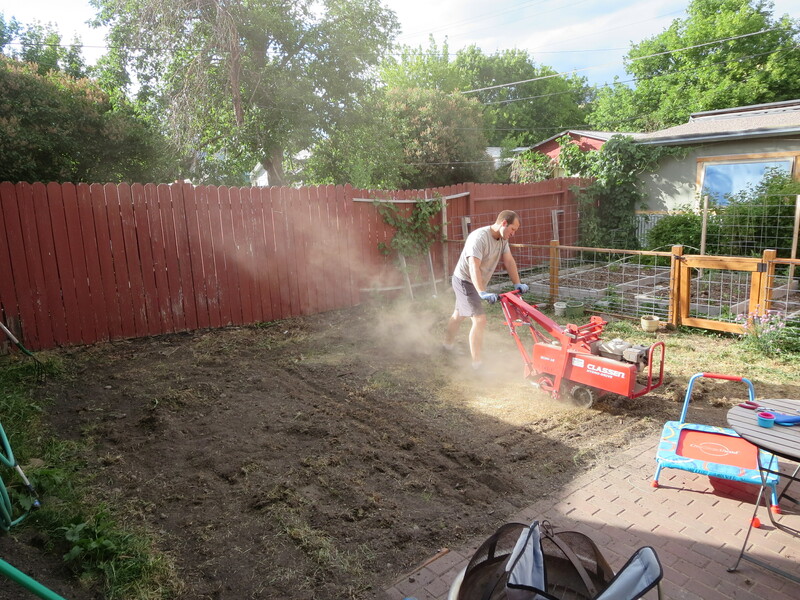 Matt bucked up and got the sod rolled out during lunch one day and in return we both lived. In a rare moment of serendipity, it rained on and off for the next 2 weeks, making our sod very happy. 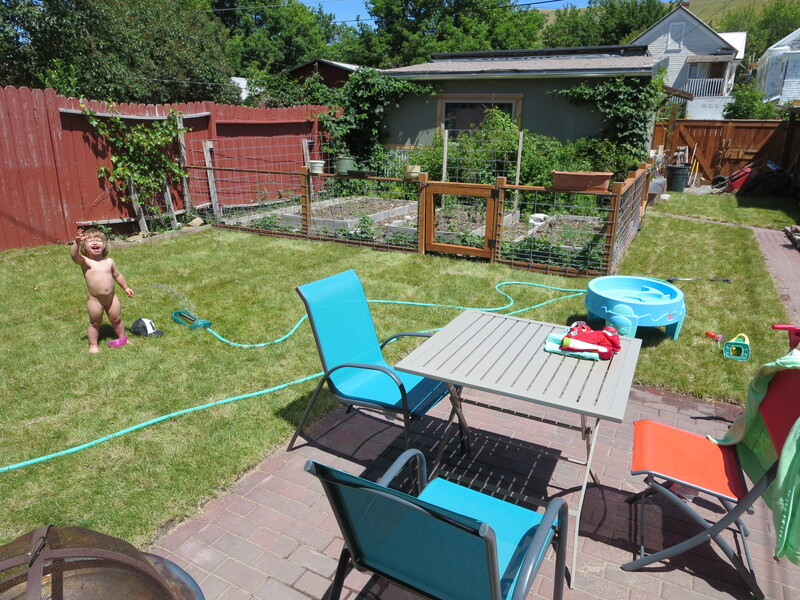 Josie is obsessed with being naked and outside in her yard; our dogs enjoy peeing and pooping all over it; and Matt and I have found a new love for grass and outdoor dining. I guess it was all worth it! Do I know my kid or what!? 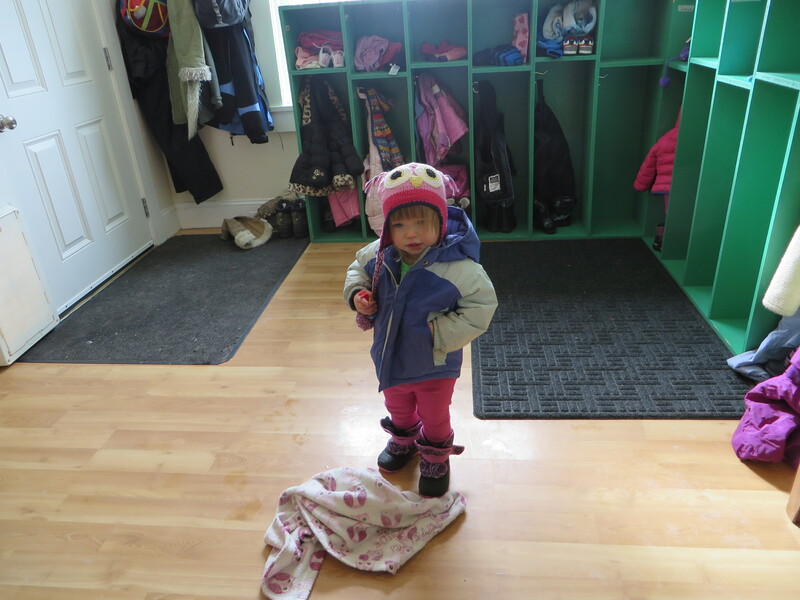 It turns out that all my fears of Josie not napping on the floor in the big kid room at school were right on. We are 1.5 weeks into this grand experiment and she has yet to nap. She will lay down on her fancy nap-pad and stare at the ceiling while someone rubs her belly. The second a teacher stops rubbing she jumps up and runs over to a sleeping kid and wakes them up by yelling in their face. Tomorrow we embark on a new adventure, Josie napping cribless in the big kid room at school. This might not seem like a big deal to most of you, unless you know Josie. Josie + napping has equaled nightmare for 2 years. 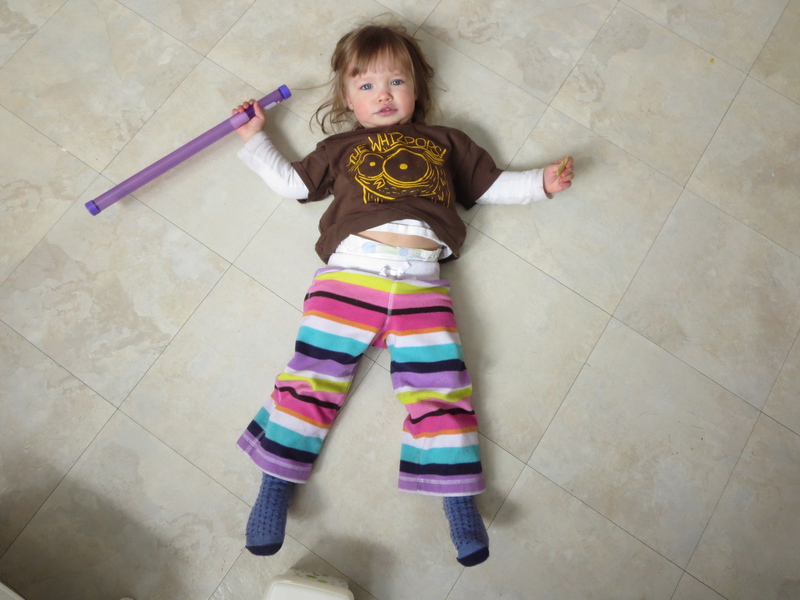 From day one Josie made it clear that under no circumstance would she succumb to daytime sleep – and she would make our lives Hell if we tried to make her. 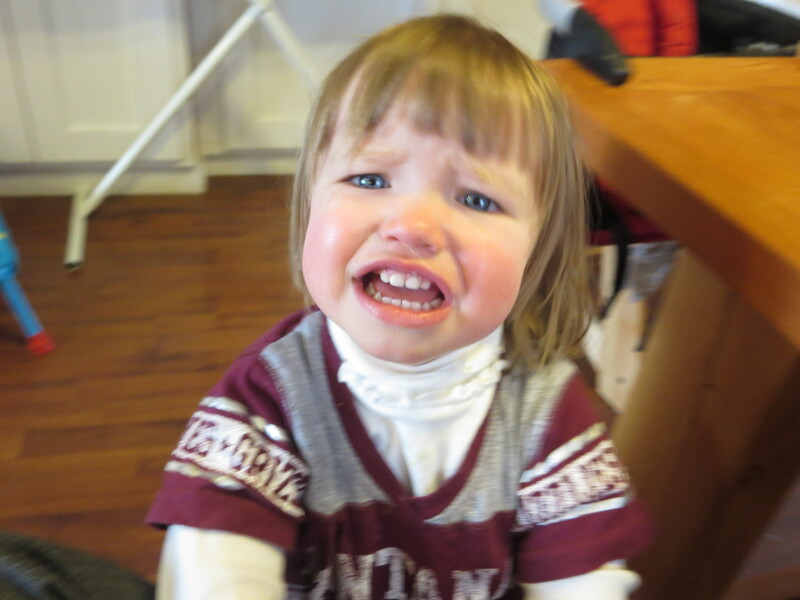 She also refused to sleep through the night for one painful year….thank the gods of sleep that those days are behind us. Sleep you say? Make me! We would watch the Houdini escape every night on our video monitor in amazement. What to do? To the internet parents! Without sounding like I am sponsored by this company, we found the Little Keeper Sleeper pjs website that promised frustration for Houdini kids and sleep for parents. A mom with triplet Houdini’s designed these lock-box pjs and I commend her. We are sending her triplets to college with the money we have spent on her pjs, so I guess that is thanks enough. 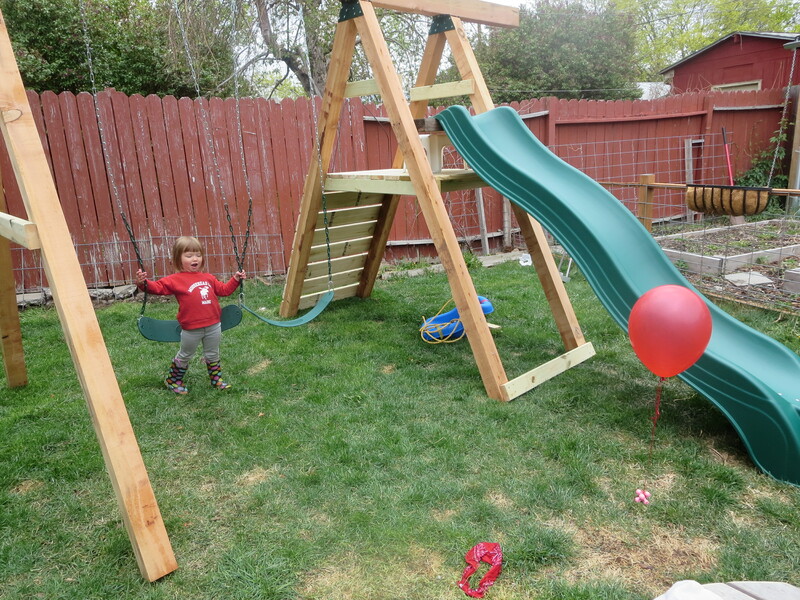 Our successful sleep routine now includes trampoline jumping + standard issue Little Keeper Sleepers. Tomorrow we are releasing the Kracken on the peaceful nap room filled with slumbering toddlers. 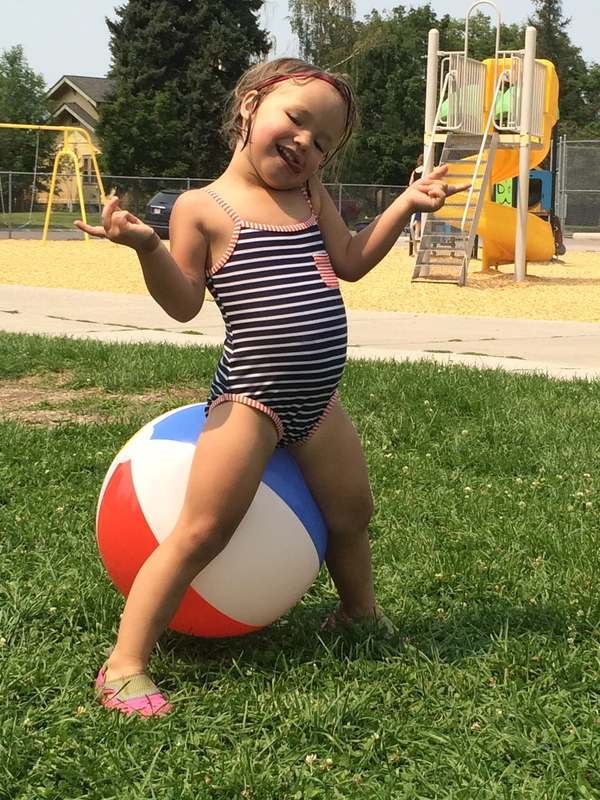 I can picture the call around 2pm; “uhh, Josie kept the whole school awake running laps over the kids and singing little bunny foo foo at the top of her lungs.” If you are a parent of one of these kids who will not be sleeping this week, I’m sorry. All I can say is that no sleep sure beats eating poo. 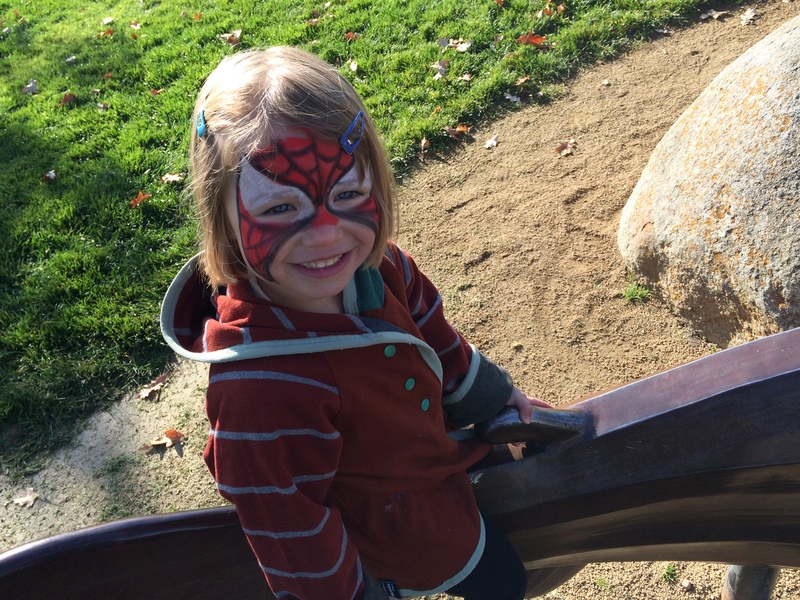 Awesome mom blog from a friend of mine! News - VT, DC, MT and beyond! Big Sky Bound · Observe as a New England Yankee attempts to transform into a Wild West Cowgirl.